Romeo at Juliet presents an unconventional love story of tow souls haunted by their inescapable past and repressed emotions that will engage you in a dramatic journey of discovering a twisted side of love as complexly tragic but as humbly inspiring as life itself. Angel has been languishing in her “trauma” that started at a very tender age. Her life changed dramatically when she falls in love with Joseph, a man whose life has been enmeshed in striving to be righteous with her controlling mother. Their relationship could have been perfect but uncontrollable circumstances set in, they travail into tearing drama reminiscent of the Shakespearian tragedy - entangled with lies, deceit, hate and ultimately love. 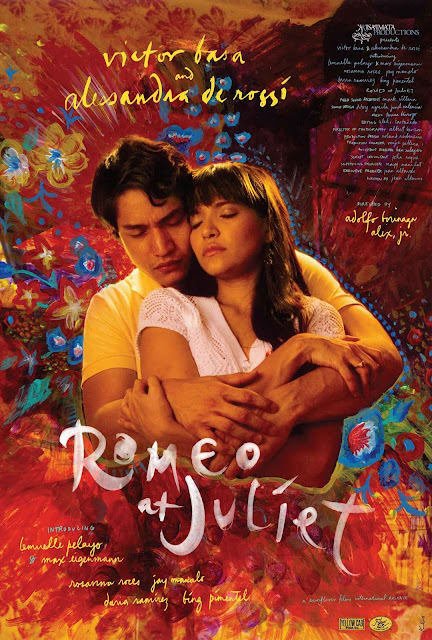 The title of a new independent film, Romeo At Juliet immediately recalls to mind William Shakespeare’s well-read work. The irony is that, the makers of this local movie actually based their project directly on an unpublished Filipino book written in 2002. The book entitled Kakaibang Romeo At Juliet tells a tragic love story that essentially presents a new take on the famous characters, hence it was called that way. It is written by first-time film producer Jean Altavas but for some reason didn’t see publication. The author, with support from some people in the biz, felt the story deserves to be released. Thus, it ended into a movie starring Victor Basa and Alessandra De Rossi in lead roles who are not named Romeo and Juliet, but as Joseph and Angel, respectively. Independent filmmaker Adolfo Alix Jr. directed it under Kisapmata Productions. In a presscon held at Max’s Roces, Q.C. to promote her first film venture, Altavas told the Manila Bulletin that her story touches on the critical issue of parenting and abuse of women and children. Though the movie is the same as most indies which tackle the dark side of life, she insisted that this one is different because the characters are not poor and underprivileged, as one might expect in most non-mainstream films. “Most of the characters here are well-off. We want to imply that troubles happen to people regardless of status,” said the one-time showbiz act who many years ago worked with big screen biggies Dolphy and Joseph Estrada. Altavas also acted for Romeo at Juliet playing the role of Malueca, the wicked grandmother of Joseph whose mom Lourdes (Bing Pimentel) is in turn overprotective. Joseph’s girlfriend Angel has her own traumatic childhood inflicted by her father Kap played by Jay Manalo. With its Freudian thought of ‘Show me your parents and I’ll tell why you’re a mess’ put into play, the plot-driven Romeo At Juliet gathers an interesting mix of supporting stars headed by Rosanna Roces and Daria Ramirez. It also introduces Max Eigenmann and Lemuel Pelayo.